Join the discussion on our forums! Come discuss Friendly Bartender over in our dedicated Friendly Bartender discussion topic. Am I the only one that really likes this card? I get it, it's a River Crocolisk with a little bit of healing at the end of turn. But, I just...I don't know how to explain it, I just love this card. Maybe I have a soft spot for real life friendly bartenders. Also I feel like the 1 point of healing at the end of turn is never NOT useful. Plus, he tends to trade well with other 2 drops or even some three drops. I don't know, maybe I'm just weird, but I never forget to tip my tauren. to make this card viable text needed to be changed to "At the end of your turn, heal a damaged friendly character for 1". It probably wouldn't break anything as "At the end of your turn, restore 1 health to all friendly characters." Comboes interestingly with Holy Champion and Lightwarden/Light of the Naaru, but ultimately unlikely to be played much (outside of arena). I don't know why. I know that this card is not particularly strong, but I really like the design. I feel like I will probably try to make it work in a few decks, maybe with reno and stuff. I really like the design. I feel you man, I love the card. If only the pre-nerf Master of Disguise was still around. There's all these cool new epics and legendaries and this guy is just all around better. 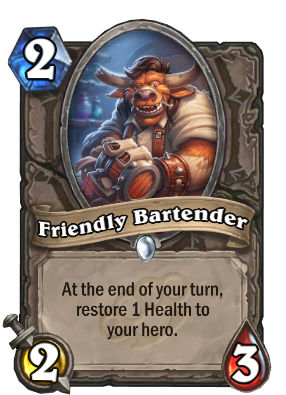 There should be an unfriendly bartender with reversed stats and effect just because. Who is this Gamon person you speak of? Maybe the missing piece for that janky "Heal Aggro" Priest deck? With all the janky lightwardens and the Light of the Narrows? Not until the NEXT expansion.